This would be my final day in Kyoto, since my Japan Rail Pass will expire today and there was a reserved hotel room waiting for me back at Tokyo. Not willing to see a single temple more, I asked the guesthouse owner where I should go in hope of seeing something different. 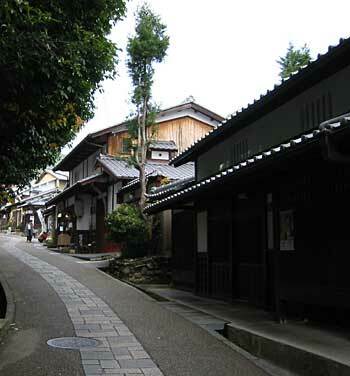 The recommendation was the Arashiyama area in West-Kyoto. So be it! From the Kyoto station I got on a train that would take me near the Arashiyama area. Just like the areas of East-Kyoto I visited earlier, Arashiyama was right beside the mountain slopes surrounding Kyoto. I followed a stream of Japanese tourists and soon I found myself in front of some typical buddhist temple, so it was "great, thanks, good bye" after looking at it for a few moments. A few moments later I ended up in a nice bamboo forest path where rickshaw runners were offering their services for the Japanese tourists (in addition for the ride they also act as personal tourist guides, I have no idea of the costs though). 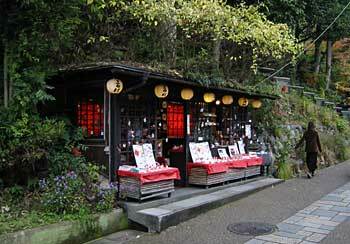 The day moved on pretty much by walking up north in the small streets and visiting two small temple areas that had quiet forest gardens. The entrance fees were around 1000-1200 yen and this applied for most temples in Kyoto, so it can get expensive if one is determined to visit every temple that happens to come by. The last temple area I visited was the Adashino Nembutsu-ji Temple, which differs from the rest by having around 8000 stone buddha statues that were found buried around the area about 100 years ago. While heading back to the train station, I stopped by for some lunch and bought some souvenirs (a small stone statue and a Japanese-style fan, which took me an hour to decide what kind I should choose). I then returned to Club Tour, grabbed my stuff, thanked the owner and took the next shinkansen to Tokyo with a boxed dinner (known as ekiben). The train would arrive at Tokyo station half past nine in the evening, leaving me only one and a half hours to find the hotel in Asakusa, since the doors for that hotel would close at 11:00am. As usual the train trip was smooth and on schedule. This time around Tokyo station was much more bearable than during my first encounter, so I guess I've adapted to the system to some extent now. I bought a magnetic metro card worth 1000 yen, so that I can stop fiddling around with the ticket machines and let the gate machines do the calculating for a change. Getting to Asakusa station was easy. Finding the hotel was a bit more tricky, but by asking directions from the ever so helpful Japanese people sorted things out. I actually entered another hotel by mistake, but the desk clerk kindly showed me where my hotel was, which was just around the corner. And again I had to admire the level of safety in the streets of this metropolis. The hotel, Ryokan Shigetsu, was the most expensive accommodation I picked for my trip (7300 yen plus tax). The room was western style and there was absolutely nothing wrong with it, but after the excellence of ryokan Kangetsu and cheapness of Club Tour, it felt too sterile for my taste and the view from the window was a wall of the neighbouring building just 40(!) centimeters away! Well, at least there was no strict bed time and I could sleep in peace. So I was back in Tokyo. Kyoto certainly was worth its reputation and I can agree that a few days or even weeks would not be enough to go through all the important temples, gardens and shrines around that area. It was easy to get an overdose on temples, so it's vital to make sure you see a bit of everything rather than concentrating in something particular or just wandering around like I did. That will only result in so many temples you get that "seen one, seen them all" feeling. 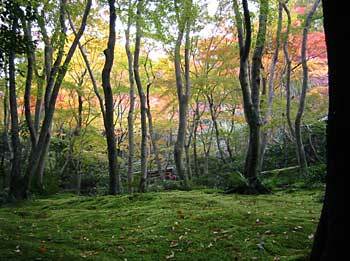 Kyoto was also an excellent base for one day excursions to Nara, Osaka and Himeji. Even Hiroshima was reasonably close, but alas I couldn't get up early. Maybe I should have bought a seat ticket a night before that might have motivated me to get up from bed (although the seat tickets didn't cost me anything). The guest house Club Tour is highly recommended for budget travelers staying at Kyoto. There is always the risk the dormitory mates might be annoying (I had no major problems with mine) and the rules may feel a bit strict, but for 2400 yen per night, I wasn't complaining! 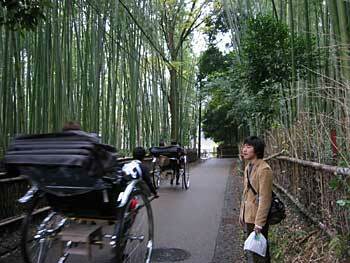 A bamboo forest and rickshaws at the western slopes of Kyoto. Yet another silent moss garden. 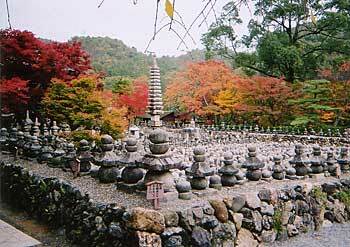 The Adashino Nembutsuji temple, where about 8000 buddhist stone statues were found. Small souvenir shops came in all kinds of styles. Ryokan Shigetsu - Those who are searching for a accommodation at Tokyo's Asakusa might want to consider this hotel.